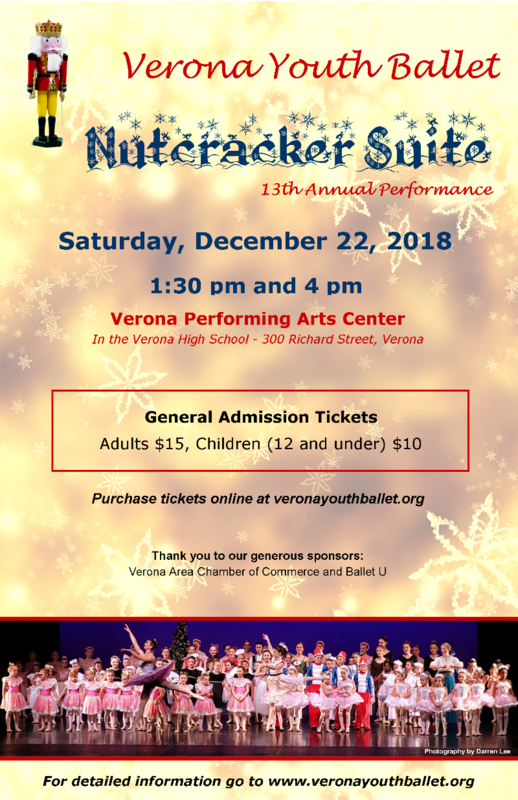 The Verona Youth Ballet will present its 13th annual “Nutcracker Suite” at the Verona Performing Arts Center on Saturday, December 22, 2018 at 1:30 pm and 4 pm. The one-hour, family friendly production will feature children and adults, amateurs and a number of seasoned professionals from several area dance studios in the popular and fascinating holiday tale. Colorful costumes, elegant Tchaikovsky music and high spirited dancing promise to please children of all ages! Online ticket sales have ended but there will be tickets available at the door 30 minutes before each show.